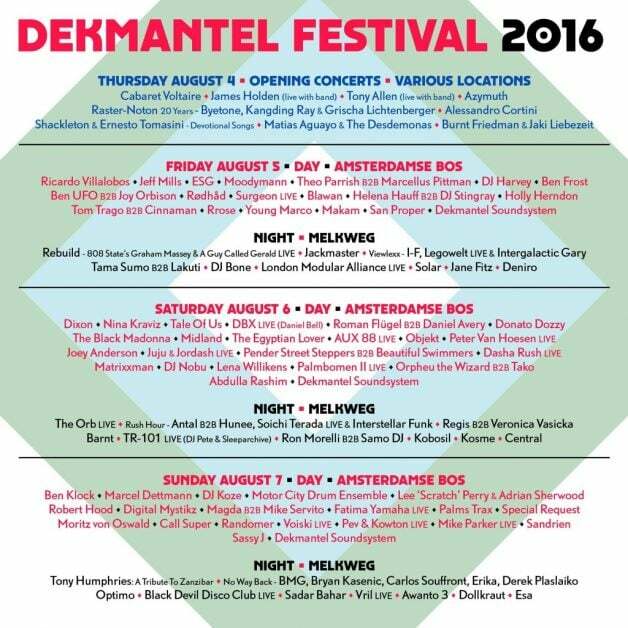 One of Amsterdam’s top destinations for left-field side of the dance music spectrum, Dekmantel, is readying their 2016 edition with another 3 days full of electronic culture. Held during the day in the sprawling nature of Amsterdam Bos, Dekmantel’s brand is as synonymous with the Dutch capital as it is for quality curation. With International dates, a renowned label, and some of the most committed followers in the game, the 4 – 7 August event will surely see its name uttered on the lips of artists and fans alike for the coming months. This year, the eclectic lineup (see full lineup and day by day breakdown below) brings back favorites like Ricardo Villalobos, Dixon, DJ Harvey, Moddymann, and Jeff Mills, while also welcoming very special performances from James Holden & Camilo Tirado (Outdoor Museum of Fractals), Afrobeat legend Tony Allen, dub pioneers Lee ‘Scratch’ Perry & Adrian Sherwood, and post punk band ESG. For us, looking down the lineup, our eyes catch the likes of Smart Bar’s The Black Madonna, NYC’s famed Bunker favs. Bryan Kasenic & Derek Plaslaiko, Japan’s DJ Nobu, 2015 Dekmantel hero Motor City Drum Ensemble, electronica pioneer The Orb, and computer music artist Holly Herndon (to name a few). Besides “the Bos” hosting daytime events, Dekmantel will virtually take over the city for their pre-festival events and complimentary Melkweg Nights. On Thursday, 4 August, the IJ river will play host to several events spread along its banks, including The Eye Film Museum, the majestic Muziekgebouw, and the Bimhuis. 3-day festival tickets are now SOLD OUT, but Opening Concert/ Night festival/ Single Days tickets are available at the link below.